Alce Nero cocoa powder is delicious, because it is made using organic farming techniques, and authentic, because its sourced from cacao grown in Latin America by small groups of farmers belonging to the Sin Fronteras cooperative society, which is committed to promoting quality and pursuing the goals of environmental sustainability and health. 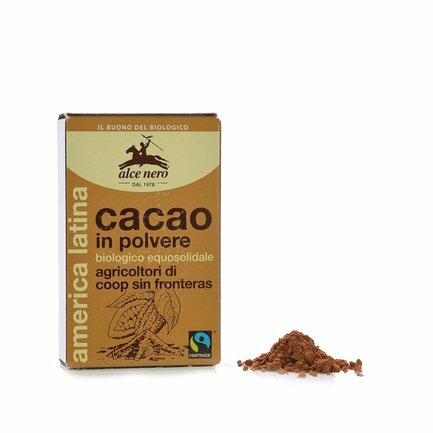 Choose this product to add the delicious flavour of a genuine fair-trade ingredient to your home cooking and baking. The Alce Nero cooperative society started working with organic farming techniques some 30 years ago. This decision, which was originally a commitment and a new ideal and tangible way of living in harmony with nature and the environment, gradually developed over the years and started to include also a commitment to using fair trade produce wherever possible. That's the background to a range of healthy, tasty and properly made foods from fruit juices to pasta, cereals and pasta sauces, all ready to be discovered and enjoyed.